VW CEO Matthias Mueller, right, and his strategy chief, Thomas Sedran, discuss the automaker's future during a news conference. Volkswagen CEO Matthias Mueller last week unveiled a 15-point strategic plan to transform a hierarchical, engineering-driven automaker plagued by low margins in its core business into a nimble company of entrepreneurs focused on serving its end customers. Over the next 10 years, Mueller said the group will cut around $9 billion in costs, sell as much as 25 percent of its vehicles with electrified powertrains, streamline its modular vehicle architectures and carve out its auto-parts operations into an independent business encompassing more than a tenth of its work force. "There is no doubt that we have severe weaknesses, above all when it comes to our structure, culture and efficiency," Mueller said during a news conference, flanked by his strategy chief, former General Motors executive Thomas Sedran. "We want to eradicate them, and the new strategy will make a considerable contribution." The 2025 road map finally puts Mueller's stamp on a company that for the past decade had been so singularly dominated by the aging duo of Chairman Ferdinand Piech and his one-time protege, CEO Martin Winterkorn. 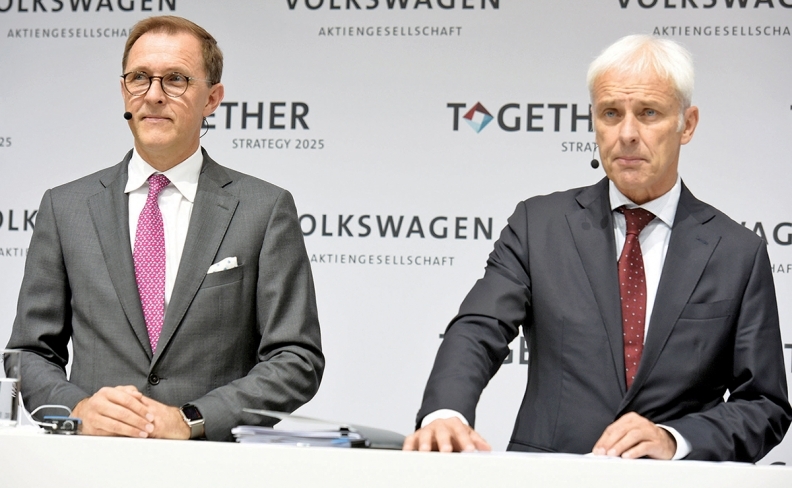 Both have since departed the company, each under his own cloud, with Winterkorn taking political responsibility in September for the diesel-emissions scandal. Mueller admitted the company suffered over the years from a "certain fixation on size" and "smugness" that partly discredited the massive growth spurt under his predecessor, during which the company doubled in volume, underlying profits and employees. Dubbed "Together" in an attempt to rally internal support for the high level of change needed, the strategy envisions a leaner, more innovative company that aims to be merely "one of the leading providers of sustainable mobility" in a nod to its newfound humility. The only explicit volume target Mueller announced was his intention to sell 2 million to 3 million battery electric and plug-in hybrid vehicles a year by 2025 -- more than the 1 million needed to meet carbon emission targets. This would account for 20 to 25 percent of group volumes, he estimated. To achieve this, Mueller said his company was examining whether to build its own electric battery packs and even battery cells on an industrial scale. He estimates Volkswagen would need 150 gigawatt hours of supply -- three times the scale of Tesla's "gigafactory." Were it to invest billions in battery production, the new plant could end up as part of an independent auto parts company carved out from the group's dozen brands and encompassing 67,000 workers. Measures such as these are designed to streamline a cost base that consumes 94 percent of Volkswagen's annual $240 billion sales revenue. In the future, the company wants to reduce its massive r&d budget from 6.4 percent of automotive revenue to 6 percent. Critics often target VW's development operations as a leading source of waste, since it generates too little in the way of meaningful innovation. Last year, VW spent more than any other company on r&d. By thinning out its model range of 340 vehicles as well as cutting costs by further consolidating the group's modular platforms, Mueller wants to save roughly $9 billion by 2025.